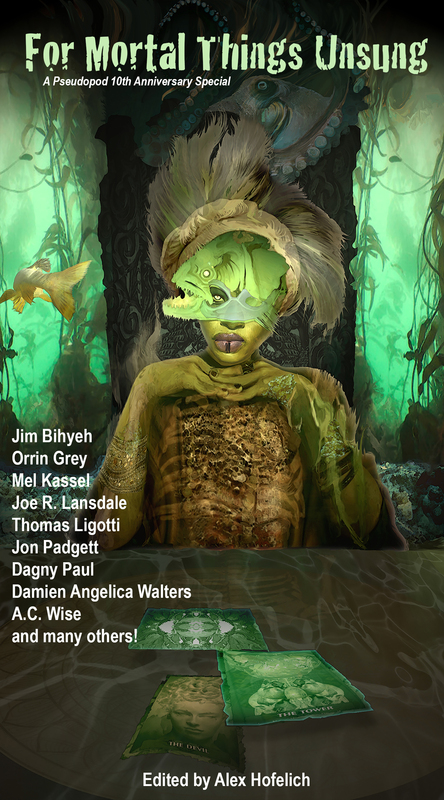 This anthology is not just “A Decade of Pseudopod.” In addition to reprints both familiar and new to the Pseudopod audience, the anthology includes brand new stories from Orrin Grey, Damien Angelica Walters, and A.C. Wise. We have a new Coyote Tale from Jim Bihyeh, a Tale from the White Street Society by Grady Hendrix, and a Tale of the Guru Keresh by Tim W. Burke. Editor Alex Hofelich has woven a thread of Pacific Ocean resonance throughout the anthology, to go along with our exquisite tiki mug. Check out the full table of contents. Cover art was provided by Hugo Award winning artist Elizabeth Leggett.